If I were to summarize the most important role of the pediatric cardiologist in two words, it would read, "decision making". This is notwithstanding the development of specific domains within pediatric cardiology as a result of which, many of us are involved with doing diagnostic and therapeutic procedures and delivering outpatient, inpatient, or intensive care. What are the Considerations that Influence How We Make Decisions? Most of us would agree here that our decisions are based on a curious mix of considerations that include our understanding of pathobiology, natural history of the specific condition, data on early and long-term procedural outcomes in the institution, and comorbidities. Because of limitless possibilities in pediatric heart disease, decision algorithms have to be individualized. Variables such as family preferences, economic condition, sources of funding, access to care, etc., are also to be considered in the individualized decision making process. For those of us who work in resource-poor environments these are often the most important considerations and they frequently impact decisions powerfully overriding all other considerations. As a result of this situation, we have increasingly become accustomed to considerable empiricism. We rely a great deal on individual or informal and unstructured collective experience, expert opinion with varying degree (often very little) of support from published data. Not all of us recognize the fact that a number of biases can potentially cloud our thinking. For example, we are all especially vulnerable to the survivorship bias when we draw conclusions on natural history based on individual experience or when we attempt to assess the outcomes after surgery or catheter based interventions. Our impressions on the results of the procedure and natural history are heavily influenced by examples of cases that we see on follow-up. We have no knowledge of those who do not reach us or who have been lost to follow-up. While we recognize that loss to follow-up may have been the result of an adverse outcome such as sudden cardiac death, we often allow ourselves to be influenced by the ones who reach us. Depending on our individual mindsets we draw different conclusions. The optimists among us tend to selectively recall good outcomes while pessimists among us tend to recall poor outcomes. Our insular existence in large tertiary care hospitals contributes greatly to both these biases, that is, the survivorship bias and recall bias. It is impossible to obtain a true perspective about outcomes and natural history while sitting in the ivory towers of large institutions where pediatric cardiac programs are located. Virtually all published data is on natural history and long-term outcomes following therapeutic interventions are from advanced economies and these results are unlikely to be the same for resource-poor environments. Given the fact that the overwhelming majority of the world's children live in resource-poor environments; it is perhaps important to generate accurate data for these environments as well. One significant challenge that perhaps needs to be addressed through systematic and collective efforts of all pediatric heart professionals in the region relates to finding answers to key questions that we all face while caring for children with heart disease in the region. The answers to many of them are not available and cannot come from studies in developed societies. Some examples of unresolved questions that frequently surface when we take care of children with heart disease are listed in the table. Some of the problems listed are common dilemmas faced in low-resource environments. Many others are significant dilemmas everywhere. However, because of resource constraints it is perhaps even more important for us to find answers to address them. Thus far there has been there is a striking paucity of efforts to systematically addresses the specific questions that we encounter while taking care of children with heart disease living in resource-poor environments. 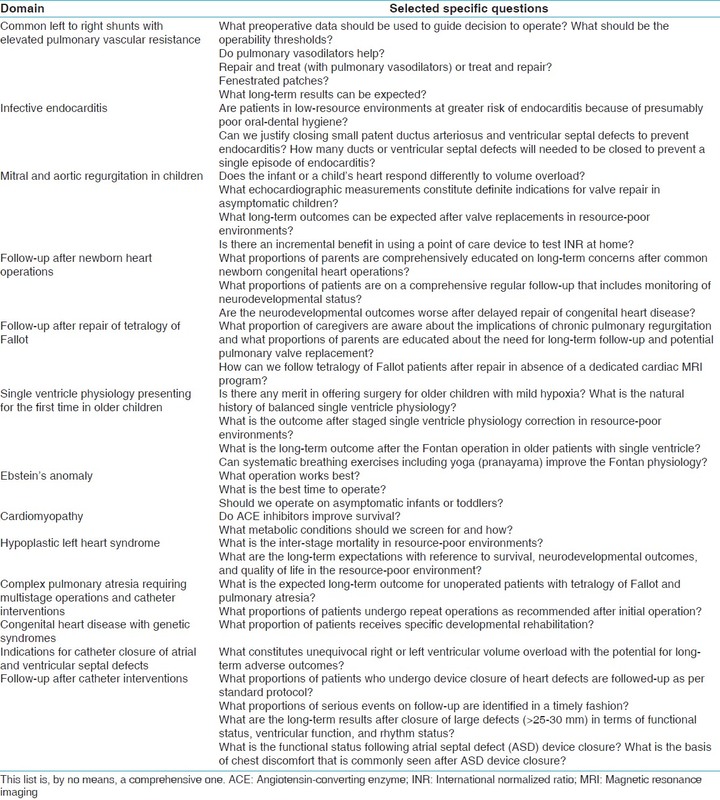 While it is true that answers to some of the questions listed in the table require complex study designs and considerable resources, a number of important questions can be addressed through carefully constructed multicenter registries for specific conditions [Table 1]. These registries cost very little when compared to large scale randomized controlled trials. For example, if we seek to make better informed decisions on common left to right shunts with elevations in pulmonary vascular resistance and "borderline" operability, we could easily design a standardized protocol for diagnostic evaluation, management, and follow-up that can be adopted by multiple participating institutions in a prospective registry. Data collected at specified intervals in a standardized fashion over several years will be of immense value in deciding on indications for closure of the shunt in this challenging group of patients. A large database will allow for a wide spectrum of clinical possibilities to be investigated. This approach is perhaps best understood as an example of Standardized Clinical Assessment and Management Plans (SCAMPs). SCAMPs have emerged as a clinician-designed approach to promoting care standardization that accommodates patients' individual differences, respects providers' clinical acumen, and keeps pace with the rapid growth of medical knowledge. , They may be especially valuable in resource-poor environments. 1. Time: The clinical workload in all institutions, private and government is substantial and little protected time is available for research. Many of us sometimes face an ethical dilemma of devoting time for research, while potentially denying attention to pressing clinical responsibilities. 2. Culture: A critical mass of professionals interested in research has not been reached in most places. Once a sufficient number of professionals get involved in research the peer group influence amounts to a changed culture and becomes a strong driving force. The culture of collaborative, systematic, and disciplined efforts to collecting high quality data exists only in a very limited number of individuals and institutions. Often, competition comes in the way of collaboration. 3. Incentives: Most hospitals in low-resource countries primarily reward clinical output and do not provide any significant financial incentive for research. Research time is largely not compensated for. This is unlike academic institutions in advanced nations, where grants funds support salaries of those interested in research. Other potential incentives that include career promotions, academic leadership status among peers are also quite limited. 4. Funding agencies: Few private companies fund independent research. A limited number of government agencies do fund research projects. However, there are significant bureaucratic delays. Investigators from developed nations often draft projects funded by international agencies to be done in the developing world. They do not always specifically address the needs of our populations. 5. Conditioning in the formative years: Most Indian medical institutions do not encourage students to think independently and to ask fundamental questions. There is a disproportionate emphasis on accumulation of factual knowledge. Medical students are increasingly unfamiliar with the process of knowledge advancement in medicine. Subjects such as research methodology, epidemiology, biostatistics, and medical informatics receive little attention. There is limited or no exposure to basic laboratory research. Students are seldom encouraged to investigate key clinical questions through a systematic review of literature. With the exception of a tiny minority, most doctors complete their undergraduate and residency years with no meaningful research output, without a practical perspective on basic or clinical research and without a keen desire to pursue research. 6. Willingness to share data: Many institutions are often unwilling to share data. Multicenter studies require the creation of robust platforms that allow sharing of data while making sure that confidentiality of the individual patient is not violated. There is considerable concern that others will use valuable data without any credit to the institution. There are reasons to be optimistic. We, pediatric cardiac professionals (cardiologists, surgeons, and intensivists) are a group that has swum a great deal upstream thus far in their professional careers. It is perhaps true that most of us have rejected a number of easier and more lucrative career options in our formative years and we are largely inspired by the challenge of taking care of children with heart disease. While we all recognize the need to obtain better quality data to guide our decisions, we have not perhaps internalized the extraordinary potential of a collective effort through multi-institutional databases and registries. The vision of the IQIC is to facilitate a collaborative comprised of healthcare teams from around the world working to create a culture of patient safety and sustainable quality improvement infrastructures for children receiving congenital heart surgery in developing world programs. A database was created to track clinical outcomes of in-hospital and 30-day mortality, surgical site and blood stream infections, as well as other critical indicators for congenital heart surgery. In the current, 3 rd year of the collaborative, the number of participating sites has grown to 39 sites almost all of whom are located in resource-poor environments and is now the world's largest database for congenital heart surgery (http://www.childrensheartlink.org/iqic). It is pertinent to state here that REMEDY is primarily initiated by adult cardiologists and IQIC has been initiated by the Boston Children's Hospital. So in the truest sense these are not initiatives put together by pediatric cardiac professionals from resource-limited environments. Initial efforts in setting up platforms for collaborative research will be challenging given the number of barriers that exist. With time and effort many of the hardships can be overcome. Once the value of data is apparent to all the stakeholders, it is likely that sufficient momentum will be generated to systematically explore key questions through a collective effort. The potential advantages are many. Because of the large numbers that are seen in individual centers, the prospect of collecting data on a very large number of patients in a relatively short period of time is a realistic one. The large numbers will also potentially allow for testing of a wide range of clinical possibilities. Collateral benefits are likely to be substantial as well. There is potential to bring about a cultural change in the participating institutions and eventually among key opinion leaders in the region. By involving trainees and fellows in collective multi-institutional research, the next generation can be engaged. This is especially vital if long-term follow-up data is to be collected and in order to ensure sustainability. 1. Bakshi KD, Vaidyanathan B, Sundaram KR, Roth SJ, Shivaprakasha K, Rao SG, et al. Determinants of early outcome after neonatal cardiac surgery in a developing country. J Thorac Cardiovasc Surg 2007;134:765-71. 2. Kumar RK, Anil SR, Kannan BR, Philip A, Sivakumar K. Bioptome-assisted coil occlusion of moderate-large patent arterial ducts in infants and small children. Catheter Cardiovasc Interv 2004;62:266-71. 3. Dalvi BV, Pinto RJ, Gupta A. New technique for device closure of large atrial septal defects. Catheter Cardiovasc Interv 2005;64:102-7. 4. Zhao SH, Yan CW, Zhu XY, Li JJ, Xu NX, Jiang SL, et al. Transcatheter occlusion of the ruptured sinus of Valsalva aneurysm with an Amplatzer duct occluder. Int J Cardiol 2008;129:81-5. 5. Kumar RK, Shrivastava S. Pediatric Heart Care in India. Heart 2008;94:984-90. 6. Rathod RH, Farias M, Friedman KG, Graham D, Fulton DR, Newburger JW, et al. A novel approach to gathering and acting on relevant clinical information: SCAMPs. Congenit Heart Dis 2010;5:343-53. 7. Farias M, Jenkins K, Lock J, Rathod R, Newburger J, Bates DW, et al. Standardized Clinical Assessment And Management Plans (SCAMPs) provide a better alternative to clinical practice guidelines. Health Aff (Millwood) 2013;32:911-20. 8. Karthikeyan G, Zühlke L, Engel M, Rangarajan S, Yusuf S, Teo K, et al. Rationale and design of a Global Rheumatic Heart Disease Registry: The REMEDY study. Am Heart J 2012;163:535-40.e1.